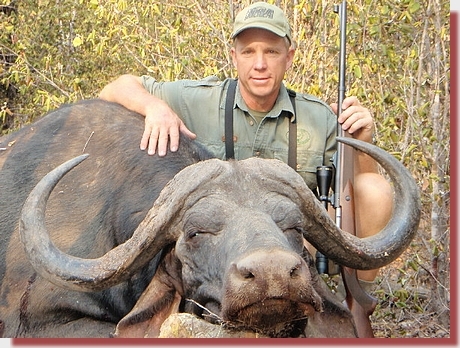 I hunted with PH Nixon Dzingai, owner of SSG Safaris out of Chiredzi, Zimbabwe. 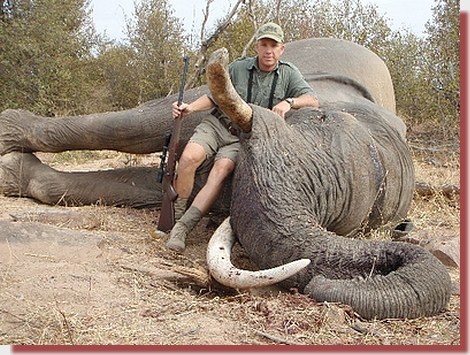 This exportable trophy elephant hunt came up on short notice so it was a bit of a scramble to get organized in just a couple of weeks. Sometimes it pays off to jump on good opportunities such as this one. Bryan Pettet (Yukon Delta) furnished me with some GS Custom .416 FN solids which I had like 2 days to load and test before the flight. On the second day of the hunt we picked up some fresh spoor of two bulls, so started the track. In about a mile we heard one sound out front. The spoor lead us up the hill towards the top of the ridge. I was very surprised how steep and rocky the terrain was that the elephants were in. Just before the crest we saw some bright steaming dung. Another 20 yards and there were the two bulls. One facing directly away and the other facing right. Peter put up the sticks which I laid my Winchester M70 on and braced for the shot. The first shot shattered bone and the bull went into the trees along the ridge top. We sprinted up the hill. I followed the tracker through the trees where, about 60 yards from the initial shot, the bull stood looking away. He wheeled around at us with his ears flared...I took aim at 25 yards for the spot I remembered in my "Perfect Shot" book - then squeezed the trigger. The bull sat back on his behind at the impact, then crashed down in the front. 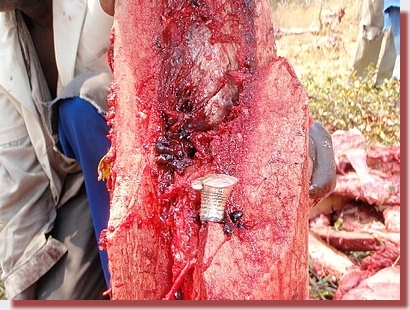 After making sure that the bull had expired, some pictures were taken - also during the slaughtering process. Below is part of the femur bone. The bullet travelled three feet after shattering the bone.